So, it turns out People’s Park is still just as sketchy as it seems. On Thursday night, a man who had been inhabiting one of the trees there for 89 days was arrested on suspicion of attempted murder, wherein he allegedly attacked another man with a knife while still in his tree. While we try and fail to visualize this scene, it should be noted that the tree -sitter in question, Matthew Dott, is not to be confused with the tree-sitters at Memorial Stadium or that one guy in front of Wheeler. Tree-sitting is kind of a local hobby. 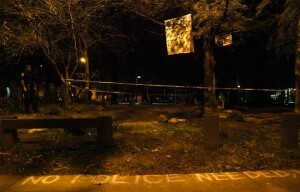 Dott, who’d previously stated he would, “be here however long it takes until this park remains a park,” whatever that means, came down from his tree voluntarily after police officers began moving in to remove him. We’d like to think People’s Park is a little safer now, but probably not by much. Amazing web site you’ve here however i was curious about should you understood associated with a community forums which cover exactly the same subjects talked about in the following paragraphs? Identification enjoy to be a a part of online community where I’m able to get reactions from other experienced people who reveal exactly the same curiosity. For those who have any recommendations, make sure you let me know. Many thanks!